A mixture of fashion and function, window seats can tie a room together while adding another cozy nook for relaxation and storage. There are many costs to consider for the project, and factors such as size, placement, and added features will affect the final price. Window seats are incredibly versatile. They can be placed in kitchens, living rooms, bedrooms, entryways, or hallways. In the kitchen, window seats can act as a light-filled breakfast nook and storage space for cookbooks, kitchen herbs, and more. In the living room or bedroom, they can act as a reading nook. Especially when combined with a curtain to close off the space, wider and longer window seats can make an excellent sleeping area for guests. 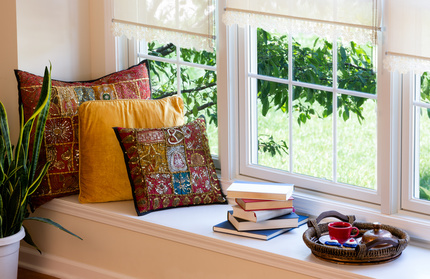 In the entryway, a window seat can be an excellent spot to store shoes and toss keys, backpacks, and purses. The price of your window seats depends mainly on the size of your project. A 3-foot DIY window seat with open storage underneath may cost as little as $100. A 3-foot DIY window seat with stock cabinets may cost around $350. For medium-sized window seats installed by a professional, you can expect to pay between $750 to $1,500. However, if you’re looking for a larger project, such as window seats that can double as a comfortable bed, expect to pay between $2,000 to $5,000. These prices ranges include any additions you may want for the project, such as cabinets built into the window seats. A window seat can be constructed with hardwood, plywood, MDF, or even kitchen cabinetry. Birch plywood is an excellent material for your window seat. The birch veneer is a great surface for painting, and its fine grain makes for a silky smooth finish. You can also stain birch plywood, although be sure the face-frame lumber has similar grain and coloration so the stain or clear finish matches the material. A 4 foot by 8 foot birch plywood panel will cost about $50. If you plan on using your window seats as additional seat, cushions are necessary. Depending on size and quality, cushions for your window seats will cost anywhere from $100 to $500. Curtains, both for your windows and to section off the window seat area, are also popular. The price of curtains for your window seats will vary by style. Panel curtains, which hang down from a rail, will cost between $30 to $300, depending on the quality of material. Café curtains, which hang from a rod, allow more sunlight into your rooms, and they cost $20 to $100. Some homeowners opt to combine café curtains with a transom to fully cover the window for an additional $5 to $60. Because prices will vary depending on the size and style of your project, window seats can fit into just about any budget. Check out HomeAdvancement's contractpr database to find a professional who can help you install this practical and luxurious space in your home.